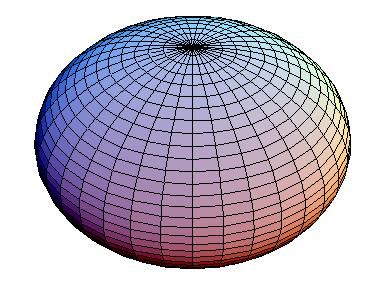 Oblate Spheroid: a "flattened" sphere that can be made by rotating an ellipse around its minor axis. An oblate spheroid is a type of ellipsoid that can be constructed by rotating an ellipse on its minor axis. McAdams, David E. Oblate Spheroid . 12/21/2018. All Math Words Encyclopedia. Life is a Story Problem LLC. http://www.allmathwords.org/en/o/oblatespheroid.html. Oblate Spheroid: AugPi, https://en.wikipedia.org. This file is licensed under the Creative Commons Attribution-Share Alike 3.0 Unported license. https://en.wikipedia.org/wiki/File:OblateSpheroid.PNG.